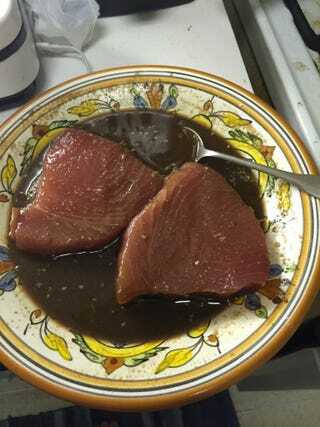 I’m marinating some tuner fish steaks in homemade teriyaki: shoyu, brown sugar, honey, sesame seeds, garlic, ginger. There will also be cous-cous with a lot of garlic, spargaruses with olive oil and bisquits slathered in buttah. What’s everyone else up to for fooding tonight?